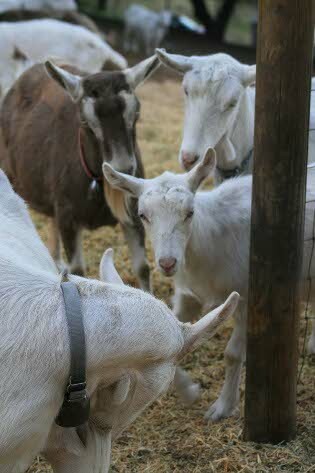 Eric Smith and I own and operate a small diversified farm in Sonoma County, at Pugs Leap Farm we milk twenty seven goats by hand and make cheeses we sell at local farmers markets in Sonoma, Marin, Alameda and San Francisco. We have a few chickens and sell the eggs at the markets. In the next few years we hope to take to the markets the fruits and nuts from the orchards we planted. We also grow onions, garlics, chards, salad greens, tomatoes, corn, squash, strawberry and culinary herbs. We intend to add a few beehives next year. HR2749 (The Food Safety Enhancement Act of 2009) which is currently making its way rapidly through the House of Representative will put us out of business. FDA approved methods by which crops are raised and harvested. The most likely outcome will be along the lines of the leafy green ordinance, scorched earth and exclusion of any wildlife. needed to create and maintain a full HACCP plan. Creating one plan would take me about 100 hours and maintaining it would take 2 hours per day of production. Based on quotes I obtained in 2006 for laboratory testing, I estimate that I would need to budget $15,000/year just for the microbiological testing of the cheeses. The International Dairy Food Association (IDFA) has published some guidelines for HACCP which were used by the National Conference on Interstate Milk Shipments (NCIMS) when it developed a voluntary dairy HACCP program in parallel with the Pasteurized Milk Ordinance (PMO). To follow those guidelines I will have to start testing every batch of milk for drug residues, I will also have to tests for pesticide residues and mycotoxins. I am still in the process of researching what amount of testing will be needed for compliance and it is still unclear if I will be allowed to do my own testing or if I’ll need to send samples to a certified laboratory. This will be decided when the regulations are written. Stopping feeding cattle a high grain diet would be much more efficient than an HACCP plan to eliminate E. Coli O157:H7 from our meat supply. The same for silage and Listeria. The practice of feeding antibiotics for faster weight gain has been linked to the presence of antibiotic resistant strains of salmonella in chicken, turkey, beef and pork. Recently MRSA has been found in pork meat. The enforcement of HACCP plan for all food producers will do nothing to address those problems. Furthermore HACCP plans are very industry friendly and rely on self regulation and self regulation does not work. For example in 2006 from January to June, Cadbury knowingly shipped products tainted with salmonella; Cadbury’s defense is that the levels in the chocolate were too low to cause illness. Plan implementation of new food safety legislation. The press release failed to mention Mr. Taylor connections with Monsanto. Mr. Taylor began at the FDA in 1976 as a litigating attorney, he left to join King & Spalding where Monsanto was his personal client regarding food labeling and regulatory issues.. He returned to the FDA as Deputy Commissioner for Policy from 1991 to 1994, overseeing FDA’s policy development and rulemaking, including the implementation of the Nutrition Labeling and Education Act and issuance of new seafood safety rules. This was a new position created for him and he instantly became the FDA official with the greatest influence on GM food regulation, overseeing the development of government policy. He was part of the team that issued the very industry-friendly policy on food biotechnology and that approved the use of Monsanto’s genetically engineered growth hormone in dairy cows. He introduced the the concept of substantial equivalence as an appropriate method for determining safety. This is the basis for the lack of safety testing and the non labeling of GMO containing food. The same concept was used to prevent dairy products to be labeled as rBGH free. Mr. Taylor left the FDA in 1994 for the USDA. In 1996 he went back to King & Spalding and in 1998 he was appointed vice president of Public Policy by Monsanto. I am very concerned that Mr. Taylor will use his position to issue very tech heavy, industry friendly regulations that will place an unbearable burden on small producers and family farms. Food safety is compromised by industrial farming practices not by sustainable farming. The cost of cheap food has been food safety. My personal check list for food safety is: no GMO, no trans fat, no high fructose corn syrup, no food colorants, no artificial flavors, no rBGH, no meat, eggs or dairy from CAFO’s. The short version is do not eat anything with a bar code. Size based regulations are possible. In the new FDA egg safety regulations producers with less than 3,000 laying hen are exempt, producers with more than 3,000 but less than 50,000 have 36 months to comply, producers with more than 50,000 have 12 months to comply. We do need farmers and consumers to start writing to your House Representative and request that HR 2749 include similar exemptions and provisions. This post is part of Fight Back Friday’s on Food Renegade blog, see more ideas for food activism here. This post is also part of Food Roots sustainability blog Carnival on Nourishing Days blog, trace your food roots here! This post is also part of Real Food Wednesday blog carnival on KellytheKitchenkop.com, check out more foodie stuff here! This entry was posted on July 29, 2009, 3:33 pm and is filed under Codex Alimentarius, Food. You can follow any responses to this entry through RSS 2.0. You can leave a response, or trackback from your own site. Pingback: Valuable Internet Information » Small Farmer Warns "HR2749 Will Put Me Out of Business"